Venice (is a city in northeast Italy sited on a group of 118 small islands separated by canals and linked by bridges. It is located in the marshy Venetian Lagoon which stretches along the shoreline between the mouths of the Po and the Piave Rivers. Venice is renowned for the beauty of its setting, its architecture and its artworks. The city in its entirety is listed as World Heritage Site, along with its lagoon. Venice is the capital of the Veneto region. In 2009, there were 270,098 people residing in Venice's comune . Together with Padua and Treviso, the city is included in the Padua-Treviso-Venice Metropolitan Area . The name is derived from the ancient Veneti people who inhabited the region by the 10th century B.C. The city historically was the capital of the Venetian Republic. Venice has been known as the "La Dominante", "Serenissima", "Queen of the Adriatic", "City of Water", "City of Masks", "City of Bridges", "The Floating City", and "City of Canals". Luigi Barzini described it in The New York Times as "undoubtedly the most beautiful city built by man". Venice has also been described by the Times Online as being one of Europe's most romantic cities. 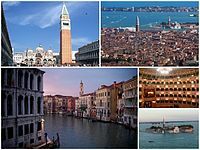 The Republic of Venice was a major maritime power during the Middle Ages and Renaissance, and a staging area for the Crusades and the Battle of Lepanto, as well as a very important center of commerce and art in the 13th century up to the end of the 17th century. This made Venice a wealthy city throughout most of its history. It is also known for its several important artistic movements, especially the Renaissance period. Venice has played an important role in the history of symphonic and operatic music, and it is the birthplace of Antonio Vivaldi.